VegWriting Momma – Page 7 – Veganism, running, and good health! So this week I have been detoxing which is something I do every so often. It’s just a good way to clense out the system and shed a few pounds. I started my week at 149 pounds on a Sunday and today, the following Saturday, I weigh in at 141 pounds! So exciting to have lost eight pounds in a week. The detox has been both beneficial and damaging. I have rid my body of toxins, lost weight, and changed my sleep schedule. On the downside, my energy during my runs are low! That’s the only real problem that I have encountered. Running has really been difficult for me and I have had to grab onto the treadmill often. I NEVER touch the treadmill when I run! What did my diet consist of? 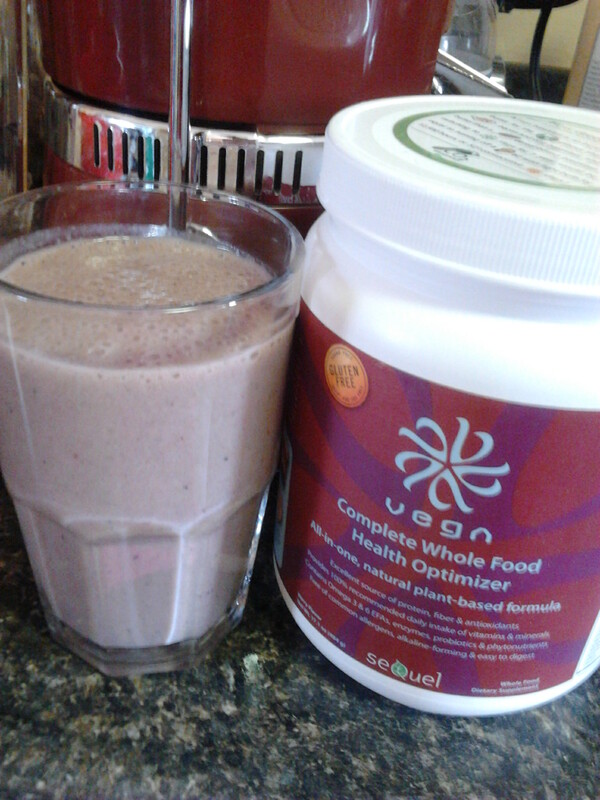 My cousin (who is also a personal trainer) turned me onto a wonderful smoothie that I am now addicted too. It is comprised of bananas, almond milk, chocolate almond milk, coco nibs, peanut butter, coconut oil, hemp protein, and ice. It is amazingly delicious! I was detoxing and having something that tasted like a dessert every day! Each day, I wake up between 5 and 6, hit the gym and then have a choco peanut butter banana smoothie, YUUUUUMMMMMY!! Protein is so important after a workout and as a vegan, a great way to incorporate protein is through a smoothie. Each day I alternated my routine. One day I would have broccoli or brown rice for lunch and then a smoothie for dinner and vice versa the next day. As the end of the week neared, I added more foods such as kale chips, brazilian nuts, and watermelon. Usually after a detox, I would revert back to my normal eating habits. This time I plan on continue on a healthy path. Not to say I didn’t eat healthy before, I just ate too much and took in too many calories. I also would like to intergrate more raw foods into my diet. This recipe will stay good for one week in the refridgerator! Make sure to add enough Cacao powder to change the color of the mousse to brown and add enough sweetness to offset the taste of the avocados. 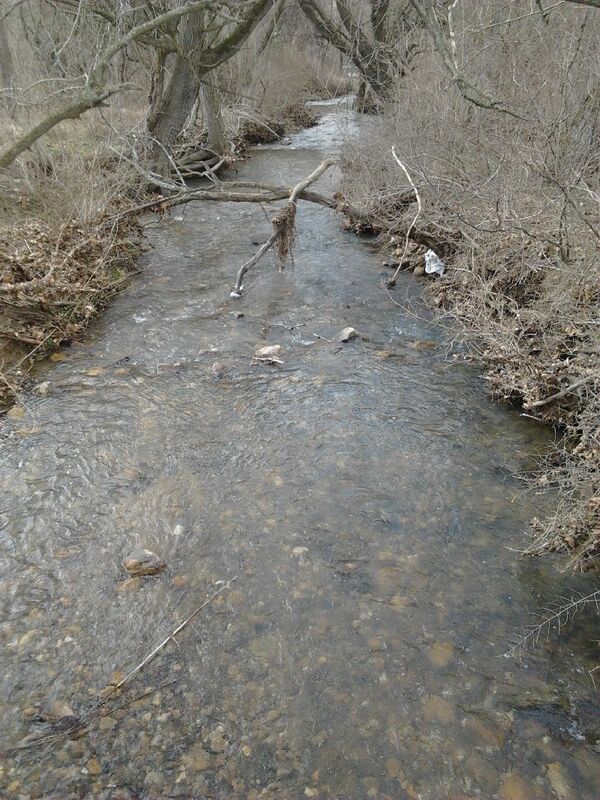 On another note, my run today improved from my last entry. I ran 3.1 miles in 29:48! Woohoo, I managed to get my time lower!! I had a hard time with this run and 4 minutes into it, I wondered if I could finish. Now way was I going to quit. Quitting is NOT an option, I pushed hard. I know that my energy level was probably a little lower from detoxing, but I am also increasing my speed significantly at the same time. By the end of the run I was running at level 7.8 on the treadmill. When I started using the treadmill two weeks ago, I was a 5.3. I run most of my time at 6.0 which is a pace of a ten minute mile and then increase as I near the end of the 5K. The goal is to keep on getting my time down. Just a few weeks left until race day! Well, I’m off to start my Easter baking…..have a great weekend and a great Easter! I won’t bore you with all the details of my runs from this past week, so to some it up….. The next day, I couldn’t resist getting a run in, so I ran a mile in 9.26! I was so happy to run such a good time (well a good time for someone who just started running 11 weeks ago). But running just one mile is easier than a 5K, you can give it everything you’ve got. When you are running a race, you’ve got to steady your pace! The next day I ran 3.1 miles(5K) in 30 minutes exactly. eat. After my last time of 30 minutes, I thought for sure that I would be under today. I set the treadmill to 6.0 which equals a pace of a 10 minute mile, and with my normal increase of speed at the end, my expectations for a lower time were high. A few minutes in, fatigue set it and once again I felt the need to run to the restroom. If you don’t know it yet, being a vegan makes you a little more than *ehem* regular. I was determined to get through this run without stopping. It was difficult, as difficult as my very first run. Well, maybe the second, haha. I had to grab onto the treadmill a few times, which I never do! It’s cheating! I even had to take a 5 second break and at one point the rubber piece went flying off of my headphones. I kept on going and picked it up at the end. I started a detox earlier this week and I’m sure it played a pivotal role in my lack of energy today. I have however, been losing weight. I have just one day of running left during my detox and just two days of detox left. I hope I do better during my next run! I’ll be sure to have some carbs the day before. I would like to take a moment here to remind people to be considerate! If you go to the gym, wipe down your machines after use. I witness a super sweaty guy use a machine and not wipe it down. It just happened to be a machine that I had my eye on just before sweaty guy jumped on it. He walked away without a second thought and his sweat was dripping from it. EWWWWW!!!!! Luckily, sanitary wipes were close by, so I grabbed two (one just wasn’t going to cut it) and cleaned up the machine. Yes, I wanted to use it that badly! Silken Tofu, great for smoothies! Well, I’m exhausted. I’m off to bed so that I can get up bright and early to hit the gym! At the gym running on the treadmill again and today I opted for the 5K program available. Usually I would set the treadmill to my own manual program. On my last run, I had a speed of 5.6 for most of the run, upping it to 6.3 at the end for. A strong finish. Today I decided to crank it up and run 6.0 the whole run giving me a pace just over a ten minute mile. I started a little slower, but quickly speed up to this point. I was doing great! Up to a time of about 22 minutes and at about 2.2 miles. I have been having trouble with my earplugs lately and my right one keeps slipping out. It seems I sweat so much, even in my ear, that the ear piece doesn’t want to hold. I am constantly cramming it back into my ear and trying to push it in far enough that it won’t pop out. Well, today I went a little too far. I managed to get it in and kept on running and as usual, it fell out again. This time, the little rubber piece wasn’t oo the end. Uh oh!! It was stuck in my ear! And it was far in there. I paused the treadmill and attempted to get it out. I could barely reach it and it started to go further in. I was able to just grab an edge of it with my fingernail and eventually pull it out. Phew, that was a close one! I had a flash of me going to the doctors to get them to pull this little ear bud out of my head. Needless to say, I will be switching to a larger piece. I was ready to continue my run and went to unpause the machine, when I must have accidentally hit a button because it ended the run! Ahhhh……. I was so frazzled by this, I didn’t really pay attention to my final stats. I was just trying to get back into my run, but it didn’t work. So I decided to start again and run an additional mile. A few minutes in, I suddenly need a potty break. Yes, potty….I have a three-year old, haha. I try to keep going, I just want to get my mile in, but there’s just no way. So at .75 of a mile I decided to stop. After my bathroom break, I moved onto weights and was really just disappointed in myself. It was probably my best run yet and it wasn’t completed! I had no idea what my total numbers were and it was all I could think about during my weight training. So, after a little over an hour on the weight machines, I decided to run another mile. I complete it around 9:23 and am happy about that! So all in all, I did just under 4 miles today + strength training for a total workout of about 2 hours. But in the end, I still didn’t feel fulfilled with my overall workout. I’m eager to get back on the treadmill and try again! 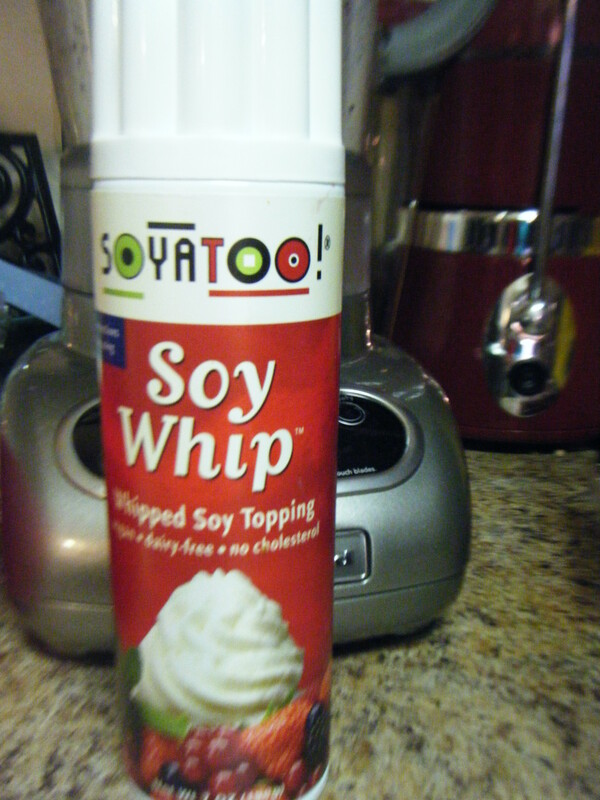 One more thing I forgot to mention…….my one year vegan anniversary just passed!! Yay, I’m so excited and can’t believe how fast a year went by. I’ve come along way and still have ways to go, but I’m going and loving it! Format GalleryPosted on April 15, 2011 May 5, 2012 Categories UncategorizedLeave a comment on Oh No, It Got Stuck! A few weeks ago, Groupon offered an amazing deal for a high-end local gym. $25 for 30 days and it’s usually $100 a month! I snatched up that deal fast! My plan was to wait until about a month before the race to start using my 30 membership and that way I could train more precisely. With the spring weather, it’s often hit or miss. At the beginning of week nine of my training, I checked the weather out and it was scheduled to rain the entire week! Usually I would skip a day of running if needed, but going every two days was far less training than I need and I certainly couldn’t miss a week! I decided to start using my groupon and since the gym had some issues activating it, I got a few extra days in for free! So my 30 day membership will expire about a week before my race. I’ve got to say, I’m really happy I started my training outdoors. For me, the treadmill seems so much easier than running outside. The treadmill pulls your foot back rather than having to force yourself forward as you would running on land. I do really enjoy the treadmill though. All of my stats are recorded for me and I feel as though I have much more control. I can fix my run to be any type I want and I can watch tv while doing so! I am also LOVING the use of a gym and am already dreading the day my membership will end *tear*. Yesterday’s run consisted of a 2 minute warmup walk, a 32 minute run, and a 2 minute cool down walk for a total of 36 minutes. My total distance was 3.3 miles. So my distance is down .1 from my last run but my time is down by 3 minutes! I really feel like yesterday was my best run yet. For the first time I actually felt like a runner. Up recently running always felt like a huge effort in an attempt to propel my body forward. This time I felt the natural spring in my step, making it seemingly effortless to launch ahead. Don’t get me wrong, there is still work involved, just in a more comfortable way. By the end of the run, it was as if someone had dumped a bucket of water over my head I was so drenched. It felt great! I absolutely LOVE running and foresee it in my future for many years to come. I would love to run a 5K when I’m 70, any takers? For a total of 39:59 and a total distance of 3.4 miles! 3.4 miles was the final distance on day 3 of week 9. My week started out on day 1 with a distance of 3.1. I really am so amazed at how well the program worked and really recommend it for those that wish to take up running and are beginners. Format GalleryPosted on April 13, 2011 May 5, 2012 Categories UncategorizedTags 5K, c25k, cool down, couch 2 5K, miles, run, running, success, training, warm upLeave a comment on Success! Total time of 34:29 with a total distance of 2.5 miles. The park I run at has a trail that laps about a mile if you follow it all the way around. I have always cut through near the middle where the trail forks off in two directions. One goes up hill, and follows the full lap around, the other cuts through, shortening the distance. Up until now, I have always feared the hill. I just wanted to complete my training and prepare my body for these long runs. It was just 8 weeks ago that I could barely run 90 secs straight! So today, after staring at the hill each time I passed the fork, I decided to brave it. After all, I am told the trail the 5K is on will be very hilly and I will be lucky just to complete the race. YIKES!!! While running today, I figured if there is an up, there is always a down so may as well go for it. I was also hoping it might result in a burst of energy once making my way back down from the top. The climb wasn’t at all as bad as I had anticipated it to be and I must say that getting to the top was awesome! Not only was it a sense of accomplishment, but to be able to look down at the rest of the park and all of the beauty that nature has to offer was a glorifying experience. By the end of week nine, I will be running 30 minutes straight, which is the amount of time it should take to run a 5K. I only have 2 1/2 weeks left of training! Well, with the couch to 5k program that is, then I am on my own. I am so excited that I have come this far! We are making popsicles! 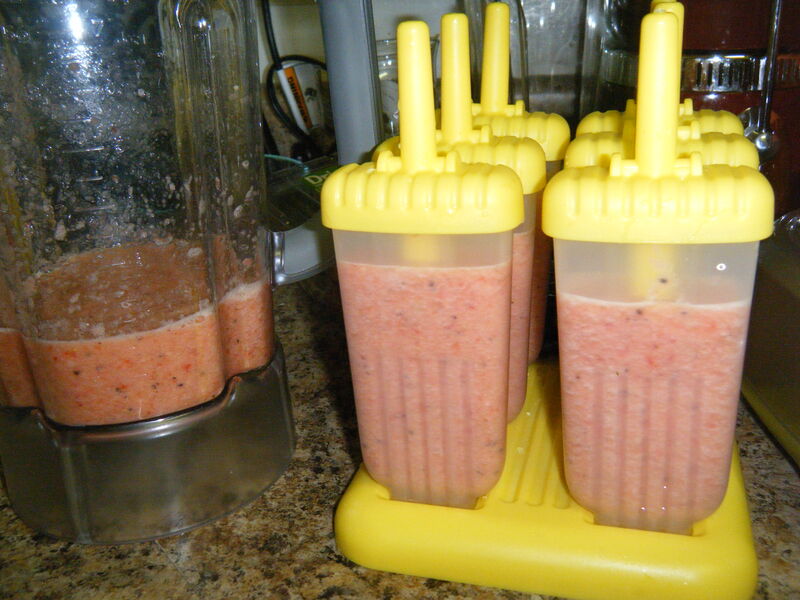 Strawberry, kiwi, and pineapple. 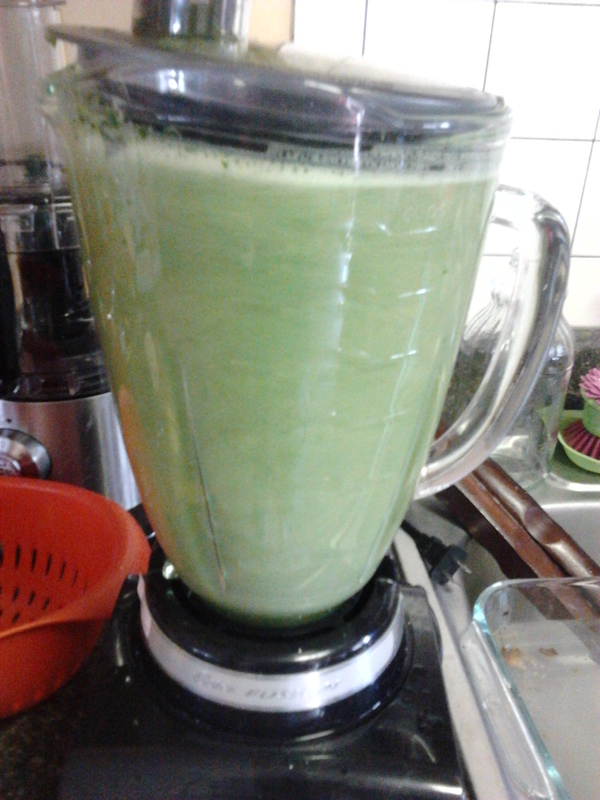 We had enough left over to drink smoothies and I quickly learn that kiwi and pineapple together isn’t the best idea. My tongue starts to split after two sips! I added agave to the smoothies and the popsicles. 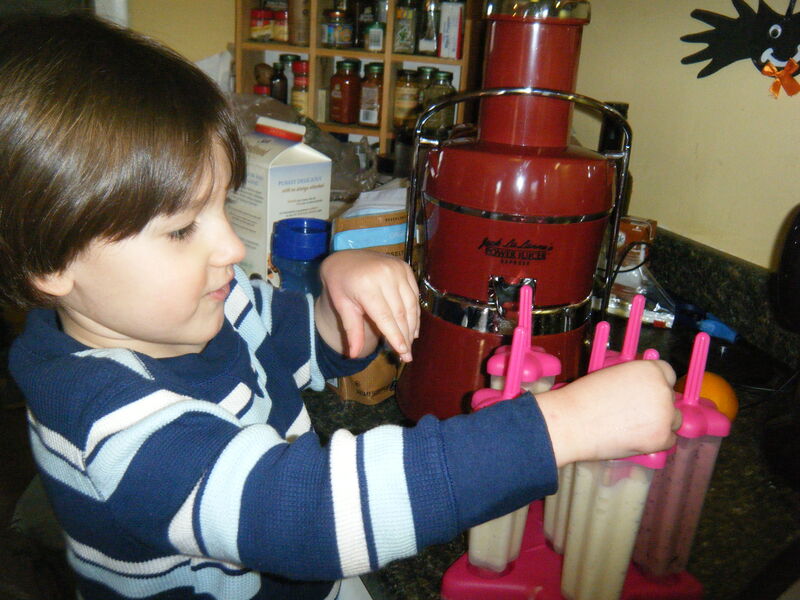 Since we made these popsicles at my mom’s house, I have yet to try them! (they weren’t ready before we left). 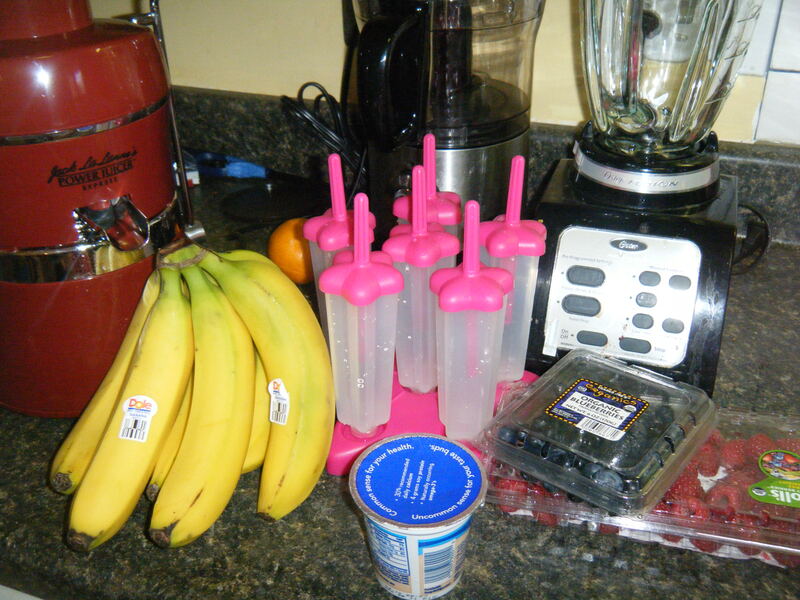 Now we make popsicles at my house using raspberries, blueberries, bananas, vanilla yogurt, and water. I really want to have smoothies from this mix so I can have my protein, so first I pour our drinks and then pour the left overs into the popsicles. Since there wasn’t enough for all, I made banana popsicles using only bananas and almond milk. And so it seems I made it a little to thick. The stick pulled right out! So we scooped them out and enjoyed! 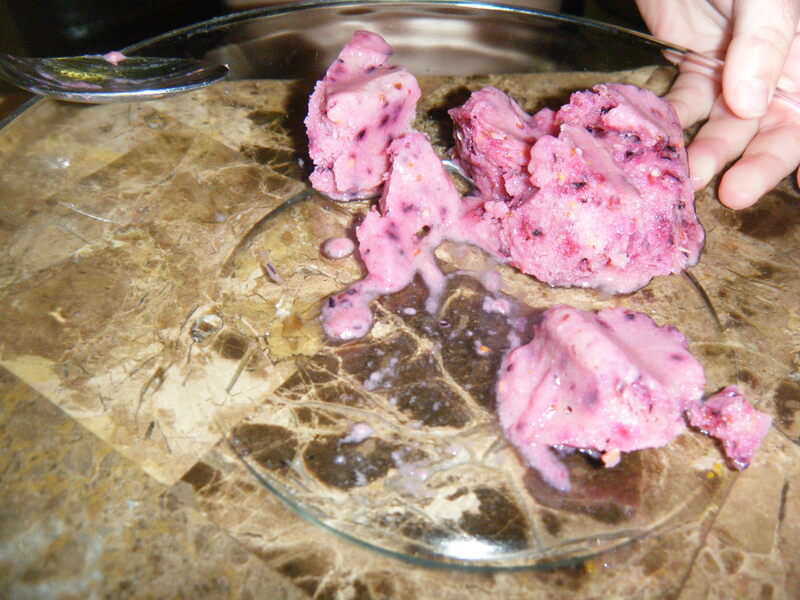 We had sorbet rather than popsicles and I think I will start making that too! Anson loves it!! 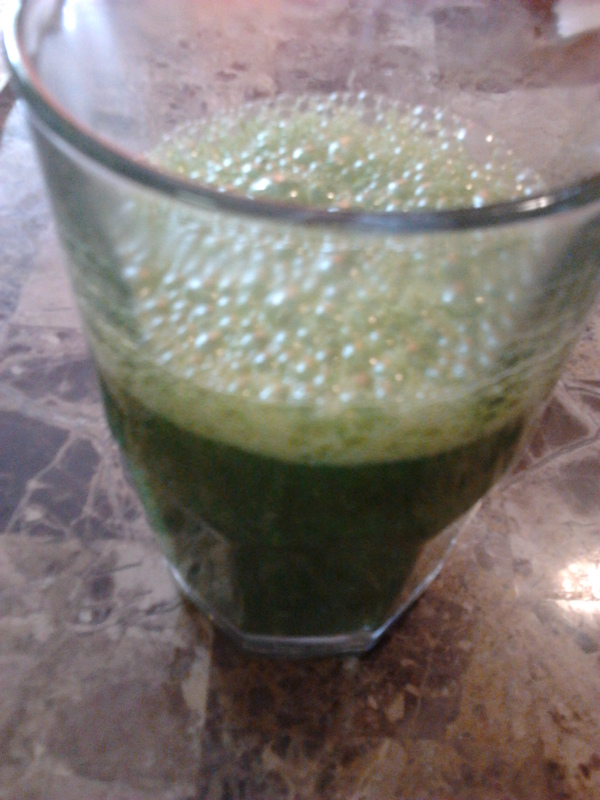 Even with bits of kale floating around in it, hahaha. 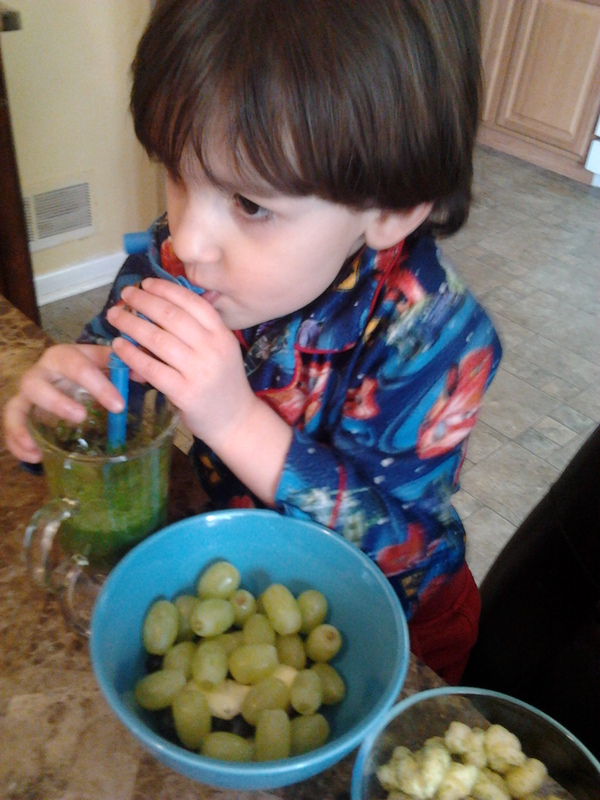 So we took it to the next level and enjoyed all green snacks.Grape kale drink, green grapes, and veggie pirates booty. Yum! So many other flavors to try, more to come……. 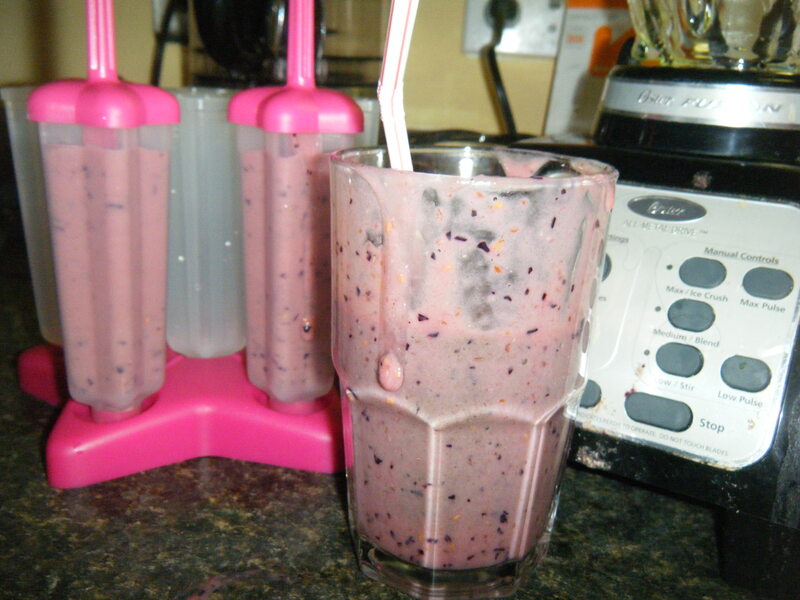 Format GalleryPosted on March 30, 2011 May 5, 2012 Categories UncategorizedLeave a comment on Smoothies Anyone? Yesterday was day 3 of week five of my c25K training. In case I have yet to mention it, c25K stands for Couch to 5K and is done in a 9 week training period. So far it has worked wonderfully for me and I recommend it to anyone that is new to running. I have to admit, I was really nervous about this day. It was only 5 short weeks ago that I was running 90 seconds at a time a breathing heavily. A few days ago I ran 8 minutes and thought that wasn’t too bad but it wasn’t easy either! So, yesterday I strapped on my running shoes, grabbed my phone (has my music and my training app on it) and went to a local park. Usually, I just run up and down the street where my mom lives(since she watches Anson while I run). It was really nice to have a chance to run at the park. There are several people running, walking, and biking. There is a path that’s roughly a mile long, two playgrounds for children, picnic areas, and sports fields. It’s really one of my favorite parks. The sun was out and it was a beautiful day, but boy was it windy! Just about everything that could go wrong, did. The hoodie I wore didn’t have deep pockets, so every time my foot hit the ground, my phone would start to bounce out. I wound up carrying it the entire 20 minute run. The zipper on my hoodie just won’t stay up and kept unzipping, so just about every minute and a half I had to pull it back up! Pandora radio would cut out on the occasion and if I bumped the connection of my ear plugs, they would stop working. The wind was blowing me over hard and I had the sniffles. A few minutes in, I had already felt winded and starting asking myself how in the hecht I was going to survive this 20 minutes of straight running. Then I heard myself say “shut up, stop making excuses, don’t psych yourself out, you can do this”. So, I did just that, I sucked it up and ignored all the little things. I focused on what matter the most, and that was completing this run. Jillian Michaels is one of my favorite trainers because she reminds me not to be weak. She makes the pain of a workout seem so insignificant, as if to feel pain or be affected by it makes one a weaker individual. I don’t see this in a negative way, it always seems to push me harder, to make me stronger. When I am running, I can hear her saying “you don’t give up at the end, that’s when you push harder”. Whenever I am working out or running and I get to the point where I don’t feel like I have anything left to give, I absorb it for the moment and then push through, even stronger than before. It is that “second wind” feeling. As you can tell, I work out to a lot of Jillian’s DVD’s, lol. I pushed through this run and completed it. I was so happy that I made it through and without stopping! My total workout time including warm up and cool down, was 29 minutes. My total distance was 2.07- the same as on day two. The fact that my distance didn’t increase was somewhat disappointing, but what I also realized is that my total time was a minute shorter! Plus, I ran for 20 minutes straight! That’s huge for me. I am motivated and can’t wait to see what my future as a runner has to offer. Please consider sponsoring me as a runner for the Poplar Spring 5K in support of abused and rescued animals. It is a one time donation and any amount truly helps. My personal page is http://poplarspring.kintera.org/faf/donorReg/donorPledge.asp?ievent=462113&supId=320767985 I am also now running with team B.A.R.N. (Baltimore Animal Rights Network). I know I haven’t even participated in this race yet, but I am already looking into signing up for my next one. Format GalleryPosted on March 14, 2011 September 9, 2013 Categories Uncategorized1 Comment on Yay, I did it!